Nothing, really. If your students follow all of the instructions, they will end up with a mini book that highlights the seasons of the year. The problem is that someone else did most of the work. All that is left for your students to do is cut, color, and paste. Can you accomplish a similar goal, allowing your students to more fully engage in the process of learning, doing more than complete a worksheet in disguise? I think so. And it's not difficult! First, teach a lesson on seasons in whatever way best suits you and your children. It need not be formal or lengthy. You can read books about the seasons, taking special note of the trees. You can talk about how trees change from season to season. You can watch a video on the seasons or find pictures on the internet. Let your student choose a colored sheet of paper. Cut it to the size you want. If you want each section to be 2.5" x 2.5", then you should cut it to 2.5" x 10". Mark the four sections of the accordion-fold book by drawing (with a pencil) light lines. These lines will be erased later. You can fold it back and forth now, or wait until it is complete. 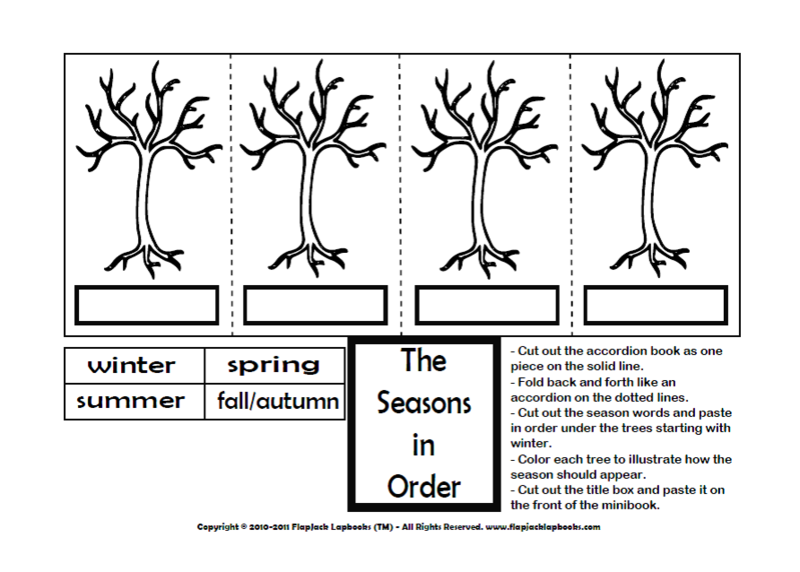 Your students will draw, color or paint, and label a tree for each season. If the block is large enough and you want to add a dash of writing to the assignment, have the students write a brief caption about or description of each tree. They will also decide on a title and make a cover illustration. If this is a once-and-done project, your students can draw and write directly on the accordion-fold book. But if you want to reduce the chances of tears (and a ruined project), it might be better to make blocks of paper that can eventually be pasted in each section. That way, if one tree is a flop, it can be redone. No big deal. Same with the captions. They can be typed and pasted to the frames which means less pressure to get the handwriting to fit exactly right in a small space.